Sounds like a very fair assessment of the novel’s strengths and limitations, Caroline. I have this, but will probably start with The Enchanted April as it’s the one everyone seems to love. Plus it’s on my Classics Club list so that’s an added incentive. It’s a shame about the lack of sympathy in this one, rather surprising in many respects. I wonder how I’ll find it – at least I have an idea of what to expect now. I was a bit disappointed. She is ironic at times and maybe some of the harsher things were meant that way. Not sure though. She came across as very self-centered and not because she likes to be alone and loves nothing more than her garden. I’d love to hear what you think. There’s some beautiful writing but I know what you mean – I think it’s kind of a class thing. I’ve been encountering that in Dorothy Richarsdsom, a real disdain and discomfort expressed towards working people. A product of the time I guess. Yes, I agree. I just think, why couldn’t she see that the way women were treated wasn’t so much different from the way working people were treated. The beautiful passages were lovely though. This was one of the first books I read this year. I too was a little puzzled by her mean streak. I wasn’t entirely sure if she was mocking herself, or didn’t really see herself in a complete light. However, it was a beautiful book! At times I was wondering the same but in the end I think she didn’t. I’m glad I’m not the only one who found her mean. The beginning and the descriptions are lovely. I hated the film of The Enchanted April and found the book just ok. Don’t think I’d like this one at all. I watched the movie but forgot all about it. I really liked the novel though but it’s been so long since I read it. I was still a teenager I think. Not sure I would still like it. I too was surprised that I didn’t like Elizabeth and Her German Garden better. The woman speaking to us knows what she wants and likes but has little patience with others, such as the unwanted guest and the Man of Wrath. Some people see this as feminist protest, but I’m not no sure. Nevertheless I went on to read Vera and The Pastor’s Wife, both of which I thought were great. They are portraits of two very different marriages. In Vera, a naive young woman is taken over by a know-it-all husband and it is scary in its depiction of his attack on her independence of mind and spirit. In The Pastor’s Wife we have a marriage of two well-meaning individuals without the least understanding of each other, whose marriage works — mostly — for that reason. Both books are better plotted than the German garden book. I really couldn’t see those passages as a feminist protest. Why would she have to be so unkind and unfeeling. I get the annoyance with the clueless Menora but not with the workers. I also found the structure clumsy, so I’m glad to hear other novels are better, especially since I’ve got The Pastor’s Wife. I’m glad to see that I’m not the only one who was surprised by the book. 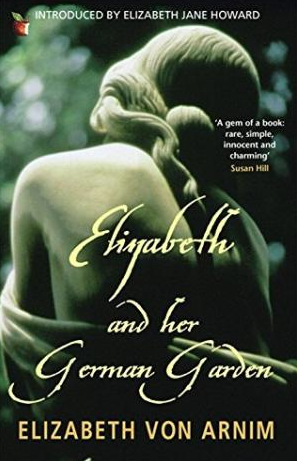 I’m so glad I’ve read your review as I read ‘An Enchanted April’ very recently and loved it, and was soon to launch headlong into ‘Elizabeth and her German Garden’. I still intend to read it, but will approach with caution! I think coming to this totally unprepared wasn’t ideal. I wish, I had known more before reading this. It was one of the reasons why I decided writing about it. I rememberloving The Enchnated April a great deal and I’m certain I’ll like some of her other novels. This is one which I used to buy in small quantities and give as gifts, especially, of course, to gardeners. But after two friends confessed that they’d found her unlikeable, I kept her to myself! Although I agree that the contrast in tones is a little startling, she does seem a realistic character, if not an entirely comfortable one with whom to spend time. I don’t recall there being much of a change in tone with the sequel, but perhaps even knowing what to expect will make it a little more enjoyable! I think that if I had known more about it, I would have enjoyed it more. I was so startled and unprepared. And the structure is uneven. In the second part she moves away from gardening. I’m glad I read it though. She’s a fine writer. I wouldn’t say it’s not worth reading, it was just not what I’d expected. I must say I loved this book, but yes Elizabeth is definitely a product of her class and the society she is part of. Her astute observations do make her cruel sometimes. I agree she writes so beautifully about her children. The way she wrote about the kids was so touching. And it has wonderful elements. I just never saw the hegative traits mentioned. Based on your commentary it sounds as if many readers have missed or ignored major aspects of the main character. It seems like it might be interesting as a character study. The fact that it has strains of autobiography complicates the issue. I think what might have kept some people from paying attention to these aspects is the fact thta it’s not only a beautiful but alos, in many places, a feminist text. Her rebellion against patriarchy and tradition is obvious. Some readers might have forgive her her other shortcomings. I read another review of this book by someone who loved it and picked it up shortly thereafter. Just did not like her or her attitude towards other people. I enjoyed Enchanted April, however. It seems we had the same reaction. She’s very condescending. Maybe it’s ironic at times but I’m not so sure it is. Enchanted April was very different. I thought I would really like the book, but couldn’t get past the first 50 pages. I usually hang in there longer than that. Oh my. And those were the pages I still liked. They are nothing compared to what comes later. I guess you sensed it earlier than I did. The horse episode annoyed me the most. She uses them to drive for hours in icy weather knowing full well it’s hard on them and then says”Everybody knows misery, why should they be spared?” or something like that. An awful way to think. My memory must be worse than I thought! I certainly don’t remember experiencing feelings about Elizabeth as you did. A good reason for reading it again. I am surprised at my reaction because I like character driven books and Elizabeth seems to have been a real ‘character ‘. I’ve read The Caravaners and Elizabeth’s Adventures in Rugen as well as The Enchanted April and must admit that it was the descriptions that affected me most. I need to reacquaint myself with Elizabeth. I am intrigued. Thank you for reawakening my interest. I’m very glad the post inspired you to rediscover hear. Let me know how you about her now. I could imagine that if I hadn’t written this post I might have ended up forgetting my negative reaction. I picked it up because I love books on nature and gardens and it didn’t disappoint in that. Thank you Vishy. I’m so glad the review makes you wish to read it anyway. I wish she’d been kinder but there were moments when I felt a kinship. I don’t think utvwas easy being married to the kind if man she was married to. Her love for her garden is very deep. Let he know how you like it if you read it.